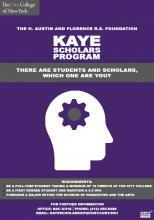 The City College Kaye Scholars Program is made possible through a generous gift from the H. Austin and Florence R.S. Kaye Foundation. It is the goal of the foundation to "assist young people in the pursuit of new frontiers in the humanities, in the arts or in philosophy and thus strengthen the intellectual and productive base of our nation."